with the spiritual." Not only is Ayon interested in relating the myths and rituals of the Abakuá to larger themes and issues, she also intends to emphasize her role in uncovering the mysteries of this closely guarded secret society. A recurring character in her work is Sikán, a woman who discovered the secrets of Abukuá and was sacrificed by the men of the society in order to prevent the dissemination of the secrets. 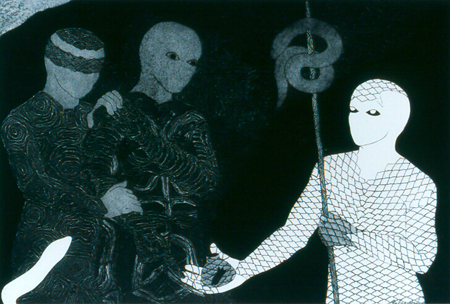 In Ayon's prints, the sacrificed victim becomes an active participant, and one cannot help but see the artist in the figure of Sikán. Ayon's work has been exhibited internationally since 1988, and is included in collections worldwide. On September 11, 1999, the artist perished at her own hands.